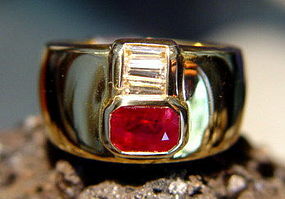 Fine 18K. Solid Gold Ring set with one Genuine Colombian Emerald @ 0.62 ct., 6 square diamonds @ 0.51 ct. and 26 Brilliant Diamonds @ 0.27 ct. total weight. Very unusual Solid Gold Sandblasted coiled 18K. 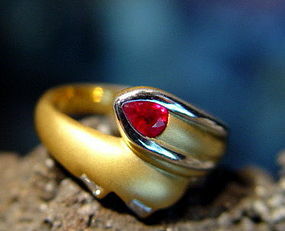 2-Tone Gold Ring (6.40 gr. Yellow and White) set with one Genuine Ruby @ 0.33 ct. and 2 tapered Diamonds @ 0.09 ct. total weight. TWO SAME RINGS ARE IN STOCK! Stylish Solid 18K. Sandblasted 2-Tone Gold Wave Ring (8.75 gr. Yellow and White) set with one Genuine Princess cut Burmese Ruby @ 0.20 ct. and 2 Brilliant cut Diamonds @ 0.07 ct. total weight. The center band on the ring with the stones is shiny white gold, not black as it appears in the photograph! 18K. 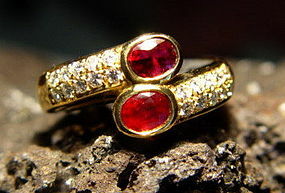 Solid Gold Ring set with Genuine Red Spinel Cab. 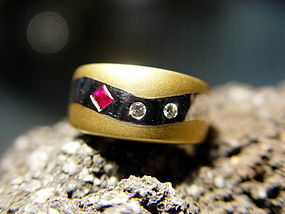 Massive and Solid 18 K. Gold Ring set with one large Genuine Red Spinel Cabochon @ 6.19 ct. 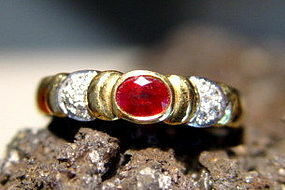 Stunning Solid 18K. 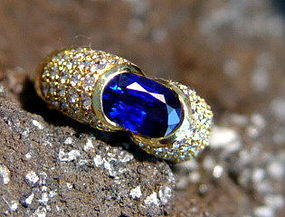 Gold Ring set with one Genuine Blue Ceylon Sapphire @ 2.29 ct. and 58 Pave Diamonds @ 0.93 ct. total weight. 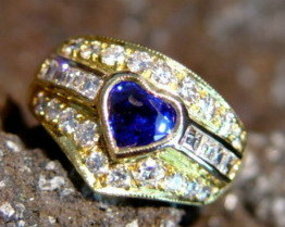 Exquisite Solid 18 K. Gold Ring set with one Genuine Heart Shaped Cornflower Blue Ceylon Sapphire @ 1.43 ct. , 8 Square Diamonds @ 0.40 ct. total weight and 19 Brilliant Diamonds @ 0.84 ct. total weight. Stunning! 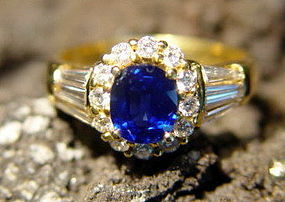 Spectacular Cornflower Blue Sapphire-Diamond Ring 18K. 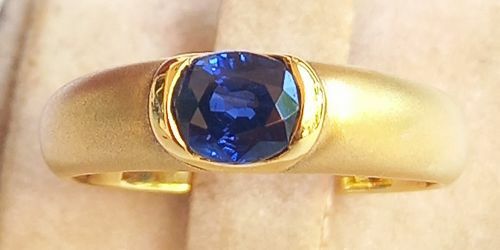 18 K. Solid 18K Gold Ring (5.71 grammes) set with Dazzling Genuine Cornflower Blue Ceylon Sapphire @ 1.57 ct. and 22 Brilliant Diamonds @ 0.30 ct. total weight. Solid Sandblasted 18K. 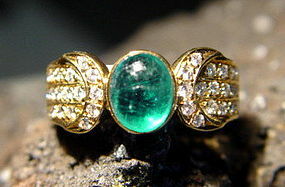 Gold Ring set with one Genuine Oval Emerald @ 0.48 ct. Solid 18K. 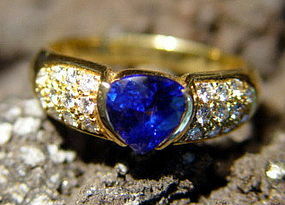 Sandblasted Gold Ring set with one Genuine Blue Spphire @ 0.92 ct. Solid 18K. 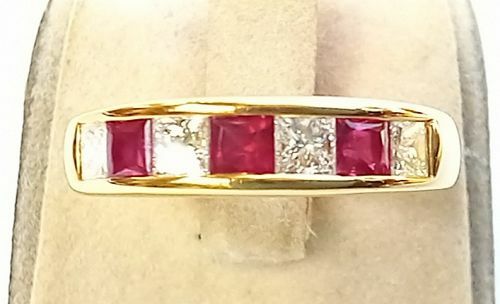 Gold Ring (4.37 grammes) set with 3 Princess cut genuine Rubies @ 0.40 ct. total weight and 4 Princess cut Diamonds @ 0.42 ct. total weight. Attractive 18K. Solid Gold Ring (8.76 gr.) set with 3 Diamonds 0.08 ct. total weight and one Genuine Ruby @ 0.15 Ct. Solid 18K. 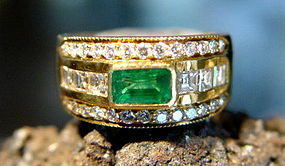 Gold Ring set with one Genuine Cabochon Emerald @ 1.04 ct., 36 Brilliant Diamonds @ 0.30 ct. total weight. Solid 18K. Gold Ring (4.1 gr.) set with one Genuine Ruby @ 0.44 ct. and 10 Brilliant Diamonds @ 0.08 ct. total weight. Solid 18K. 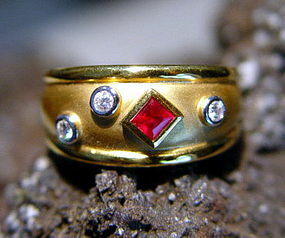 Gold Ring set with 2 Genuine Rubies @ 0.74 total weight and 20 Brilliant Diamonds @ 0.32 ct. total weight. Solid 18K. 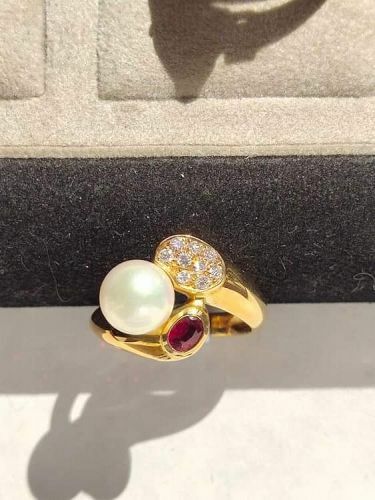 Gold Ring set with one cultured Japanese Pearl @ 8 mm., one Genuine Ruby @ 0.30 and 9 Brilliant Diamonds @ 0.17 ct. total weight. 2 Rings available! Solid 18K. 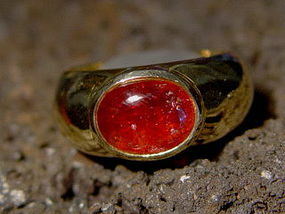 Gold Ring (3.42 gr.) 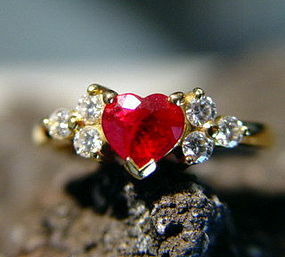 set with one stunning genuine heart shaped fire-red top Ruby @ 1.04 ct. and 6 brilliant cut Diamonds @ 0.28 ct. total weight.